A former NSA contractor, who pleaded guilty to leaking a classified report on Russian hacking of the 2016 U.S. presidential election to an online news outlet last year, has been sentenced to five years and three months in prison. Reality Winner, a 26-year-old Georgia woman who held a top-secret security clearance and worked as a government contractor in Georgia with Pluribus International, initially faced 10 years in prison and a $250,000 fine. However, in the U.S. District Court in Augusta, Georgia on Thursday, Winner agreed to a plea agreement that called for five years and three months in prison with three years of supervision after release. Back in May 2017, Winner printed out a top-secret document detailing about the Russian hacking into U.S. voting systems, smuggled the report out of the agency in her underwear, and then mailed it anonymously to The Intercept. The Intercept, an online publication that has been publishing classified NSA documents leaked by Edward Snowden since 2014, later published the five-page report provided by Winner on its website. The leaked report claimed in August 2016, Russia's military intelligence agency GRU "executed a cyber attack on at least one U.S. voting software supplier and sent spear-phishing emails to more than 100 local election officials days before [the] election," revealing U.S. intelligence agencies knew of Russia's efforts to hack into its voting systems. Winner was caught after The Intercept apparently contacted NSA officials and turned over a copy of the report to verify its authenticity while asking for comment before publishing its report. That gave the government the idea that the classified report was had been printed out and stolen from its facility. The officials then used "microdots" (nearly invisible yellow dots) on the printout to identify the exact printer where the document was printed. "In particular, she knew that the unauthorized disclosure of information classified TOP SECRET, which is the highest classification level, reasonably could be expected to cause exceptionally grave damage to the national security of the United States, and that violation of rules governing the handling of classified information could result in criminal prosecution," Department of Justice said in a statement. "Revealing sources and methods to the advantage of our adversaries and to the detriment of our country will never be acceptable and the FBI and Department of Justice will spare no effort to prosecute and punish anyone who would do so." said Special Agent in Charge. 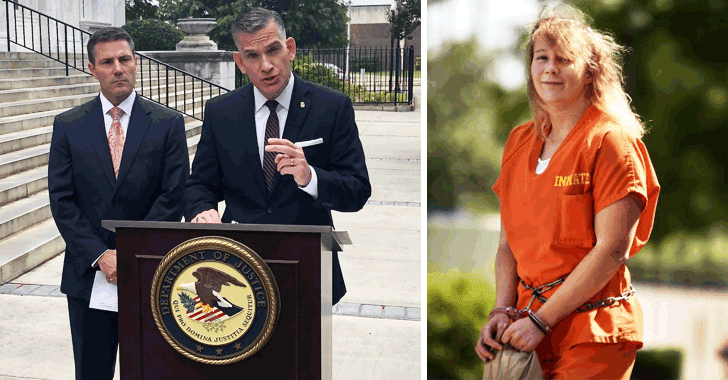 According to the federal prosecutors, Reality Winner received "the longest sentence served by a federal defendant for unauthorized disclosure to the media." Winner's defenders called her a good person with an otherwise clean criminal record, and argued she should be hailed as a whistleblower who eventually performed an important public service. Since Winner she was arrested last June, she has been held without bail and charged under the U.S. Espionage Act.